Some of the biggest names in the world have attended the Indianapolis 500, from famous movie stars such as Clark Gable, Paul Newman, Jack Nicholson, James Garner and Mark Wahlberg, to more recent popular music icons such as Lady Gaga and Kelly Clarkson. But it’s pretty hard to top the 87th Indianapolis 500 on May 25, 2003. President George H.W. Bush, the 41st President of the United States, and his successor, President Bill Clinton, were both spectators that day at the Indianapolis Motor Speedway. They became the second and third former United States Presidents to attend one of the greatest sporting events in the world. The first was former President Gerald R. Ford, who came to the 1979 Indianapolis 500. Harry Truman attended the Indy 500 in the late 1930s before he was president. When Bush and Clinton attended the Indy 500 in 2003, they were both invited by some high-powered individuals in Indianapolis. Bush was the guest of then Indy Racing League team owner Tom Kelley. Clinton was the guest of Indiana Pacers owners Herb and Mel Simon. Before the start of the race, Bush drew cheers from the fans as he walked down pit road. Bush showed his political nature by cheering for Kelley Racing’s two drivers, two-time Indy 500 winner Al Unser, Jr. and Scott Sharp. Sharp crashed in the first turn on lap 181 but two of Kelley's three drivers finished in the top 10. Tony Renna was seventh and Al Unser Jr. ninth. “It was a great honor, what can I say?” Unser told the Verizon INDYCAR Mobile App. “We walked out together from the garage out to the starting grid and that was before they had driver introductions before the 500. I remember all of the security that was around us. It was something I will never forget. It was really just a great honor to walk out with President Bush. Unser put out a photo of him talking to President Busch that day in Kelley Racing’s garage in Gasoline Alley on his social media over the weekend. “I was surprised how tall President Bush was,” Unser recalled. “In my life, I have met both President Bush and President Ronald Reagan and they were both very tall men, who were also very warm. I don’t remember what we talked about because I had the race on my mind, but I do remember walking out of Gasoline Alley with President Bush to head to the starting grid. Not to be overshadowed by the man he defeated in the 1992 Presidential election, Clinton decided to stop by a souvenir trailer between the Pagoda control tower and the Tower Terrace grandstands. Clinton purchased some souvenirs, including an Indianapolis Motor Speedway cap with flames on the bill, and drew a huge crowd. He chatted with the fans and signed autographs. It was the second Indy 500 for Clinton, who was Governor of Arkansas when he came in 1987. Ron Green was the Indianapolis Motor Speedway public relations director at that time. He couldn’t resist placing a phone call to Jerry Gappens, who was the PR Director at Charlotte Motor Speedway – site of NASCAR annual Coca-Cola 600. “Jerry, do you have Bill Clinton buying souvenirs at your track?” Green said to Gappens on the phone. “No,” replied Gappens with a quizzical tone to his voice. “That’s because he’s here,” Green bellowed into the phone. It was a good-natured ribbing because Green worked with Gappens at one time at Charlotte Motor Speedway before Green left that track to join the Indy Racing League in 1999. 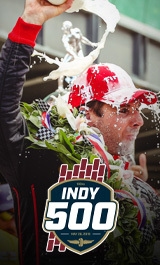 It was also another historic day in the history in the truly American sporting event known as the Indianapolis 500. To have two former United States Presidents in attendance that day solidified its place in American history even further. President Bush passed away peacefully on Friday night at age 94. The Indianapolis Motor Speedway is among many of the institutions that will lower the United States Flag to half-mast for the next 30 days in his honor.